In a field that often favors cool, clinical detachment over wide-eyed enthusiasm, Milwaukee cinephile Mark Borchardt remains an outlier. Ask the resident filmmaker/writer/actor/raconteur a question about, say, the films of John Cassavetes or George Romero, and you’ll likely receive a rambling, encyclopedic, and moving lecture on the power of film. That boundless optimism is surely what attracted Milwaukee filmmakers Chris Smith and Sarah Price to Borchardt in late 1995, eventually resulting in the award-winning 1999 documentary American Movie. That film detailed Borchardt’s oft-painful (and hilarious) struggles to make Coven—a small, independent film intended to finance a larger dream project, Northwestern. After American Movie took home the Grand Jury prize for Documentary at the Sundance Film Festival, Borchardt became something of a national star, and remains a recognizable and endearing Milwaukee fixture to this day. On Saturday, Oct. 6, at the Oriental Theatre, Borchardt will preside over the first installment of “Mark Borchardt Presents” for the 2012 Milwaukee Film Festival. 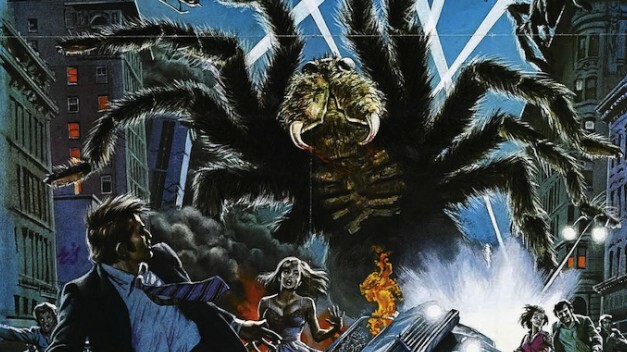 His inaugural selection will be 1975’s The Giant Spider Invasion, a low-budget, Wisconsin-made drive-in hit that was once fodder for the Mystery Science Theater 3000 crew. The film’s director, Bill Rebane, will also be in attendance. In advance of the screening, we met up with Borchardt at the Milwaukee Public Market to discuss The Giant Spider Invasion, the lingering after-effects of American Movie, and his undying love for cinema. The A.V. Club: Walk us through a typical day of Mark Borchardt. Mark Borchardt: I write every day. Whether I’m working on a screenplay, a stage play, a short story, poetry, or this that and the other thing, I write on a daily basis. That’s what I always have done, always do, and always will do. Film-wise, I’ve shot about four different projects, and now it’s time to get around to editing them. I’m not a big fan of sitting in front of a screen. I don’t watch TV whatsoever, except for the Packers. AVC: It seems like you’re the type of artist who’s addicted to working. MB: I don’t think “addicted” is right. “Addicted” sounds unhealthy. I think I would have a very mild case of it compared to all of these people [motions to lunchtime crowd] who are obviously focused and are reaping the benefits of it. It’s very spiritual to me. It affects the neuro-chemicals. It gives you a sense of place and consistency. It’s a fair implication, and I think it’s kind of a cool implication, in a sense. I guess what I’m saying is that addiction means a lack of control. I can turn things on and off just like that. AVC: So what project is front and center on your plate right now? MB: That’s an interesting question. I work on a great, eclectic plateau. This isn’t going to answer your question—this is a little bit of a digression—but you always have to fit time in the cracks and crevices. Last night I finally had to type in some short, abstract plays—from handwriting to typewriting. But honestly, there are so many different things that I’m working on. It’s like many, many different fields where things have been planted and they’ll one day come to fruition. AVC: Are you still pursuing acting? The last time I saw you onscreen was in Frankie Latina’s Modus Operandi. MB: Frankie is a longtime and dear friend of mine, so I would certainly be in one of his films. Other than that, it’s not something that I really get into. Getting paid well? Hell yes. But other than that, it’s not a real big interest of mine. AVC: Let’s talk about The Giant Spider Invasion. Beyond being shot in Wisconsin, what drew you and Milwaukee Film to this particular movie? MB: We were looking for a film that was under the radar. We had some choices, and it came down to The Giant Spider Invasion. It was shot in Wisconsin in the mid ’70s. I actually knew of Bill Rebane, the director, about 20 years ago. I had the very good fortune of having a 16mm screening of Bill Rebane’s The Demons Of Ludlow. I had never seen The Giant Spider Invasion, but I always heard rumors about it—how it was the most profitable of his films, and how it made a considerable amount of money relative to the drive-in circuit. I finally got a hold of a copy, and I have to say, it never loses your interest. It has this perpetual, quixotic charm to it. It never misses a beat. There are no lags of boredom or anything like that. MB: Absolutely. Films that like walk a fine line, between being so bad that they’re good, or just plain bad-bad that you get this horrendous irritability worked up in you. Films like that walk a fine line, but this one succeeds, man. Sometimes it has self-confidence, but other times it admits its own low-down origins. AVC: Do you see any connection between you and Bill? Filmmaking brothers-in-arms, or something like that? MB: Well, let’s see, there are about 7 billion of us [on the planet]. We both make films in Wisconsin. I’ve seen an interview with him, and he seems to be a very down-to-Earth guy. He doesn’t have any airs about him, nor does he have any pretentions about his own filmmaking. He’s pretty good at calling it for what it is. When I did Coven, I had a lot on my mind. I would have put more… Well, not only that, but I was pretty cantankerous with all of the lights and the camera. Just trying to always put that together yourself, and have the shot list ready for the next day, and so on and so forth. Coven is what it is. It’s an artifact of its circumstances. AVC: Coven came out about 15 years ago, right? MB: Well, either you’ve done your research or you have a great gut instinct. AVC: No, I remember. It was ’97 or ’98. MB: ’97, sir. It premiered at the Times Cinema on June 12, 1997. AVC: That film was intended to raise money for a larger project, Northwestern. What’s the status on that? MB: It was a film for its time. Had I the guts and the confidence, I would have went ahead and did it, but it just didn’t pan out that way. But I’m working on it, without a doubt, so it’ll be interesting. But again, it was a film for its time, and that time is gone. But there will still be an incarnation of it. AVC: American Movie, of course, documented the making of Coven and Northwestern. How much of that documentary still looms over you? MB: Nothing looms over me—what it does is loom over everyone else. That’s still the context that people approach all this from. With me, it’s like, “Who is this dude you’re talking about?” It’s like mixing oil and water. The documentary was just an incredible piece of film-work by Chris Smith and Sarah Price. They were just dedicated to the max, and it paid off. Very few people would have had that focus, and that’s why very few people succeed. From the get-go, when you’re a little baby in the crib, you might be crying a little bit, and then people start waving little toys at you to distract you. That’s what we do with babies. Then we get past that stage and some of us start forming—but a lot of people still seek that little colorful toy waving around, and they therefore cannot solidify nor explore their self-potential. What the hell was the question? What prompted this? MB: Right. That’s why Chris and Sarah were a success, because they had highly successful attributes which are pretty singular when juxtaposed with the general population. AVC: Getting back to The Giant Spider Invasion. Have you spoken to Bill about the film? MB: Yeah, I spoke to Bill recently. What was interesting was that he had to be pulled back into the house because he was working on a set for a new project. It’s interesting that after all these years, I call him, and he’s hands-on right in the middle of something. I have yet to meet him, but it sounds like he has that perseverance, ambition, and that particular focus to get things done. I think he’s a good man and a good time. AVC: What are you guys going to chat about? MB: We’re going to do a Q&A. What I’m interested in is his background. How he came into filmmaking, what were his seminal experiences, and so on and so forth. It’s interesting because he has that unique perspective on his time: Who did he encounter? What were some of the challenges of making his films? These are all nuggets of gold that we’ll unearth on that stage. AVC: In general, are you still as excited about cinema as you were, say, 15 years ago? MB: [Shocked] Wha…! Dude! When I see Frankenheimer’s Seconds, I have excitement, I have remorse, I have everything. That’s real, dude. That’s real, my friend. Cinema like Cassavetes’ Faces, Bergman, and all that stuff, that’s real excitement. You start talking about the here and now and my emotions start to dull, my hopes become dispirited. But when we get back on track and get down to the people who really made films, we’re back on board with excitement.